The stately and luxurious look of this power reclining sofa is created through details such as thee plump cushions and traditional design. Rolled arms featuring nailhead trim and jumbo accent stitching ensure this piece is a perfect fit in your living room or cozy game room. The Bingen Traditional Power Reclining Sofa with Nailhead Trim by Signature Design by Ashley at Miskelly Furniture in the Jackson, Pearl, Madison, Ridgeland, Flowood Mississippi area. Product availability may vary. Contact us for the most current availability on this product. Fabric Content All fabrics are pre-approved for wearability and durability against AHFA standards. 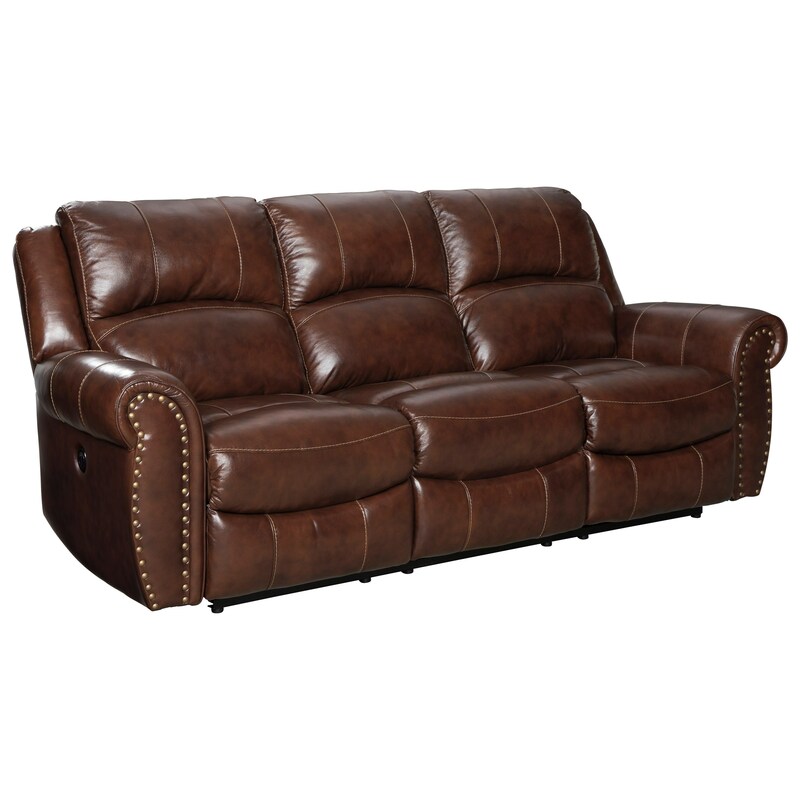 Top-grain leather interior upholstery; vinyl/polyester exterior upholstery. Tailoring Stripes and patterns are match cut. Style also features Jumbo Stitching. Anchor your living room around classic and stately style with this upholstery collection. Features such as the rolled arms and nailhead trim detailing highlight the traditional design of these pieces. Available in both power and non-power options, this collection is cozy as well as classy. The Bingen collection is a great option if you are looking for Traditional furniture in the Jackson, Pearl, Madison, Ridgeland, Flowood Mississippi area. Browse other items in the Bingen collection from Miskelly Furniture in the Jackson, Pearl, Madison, Ridgeland, Flowood Mississippi area.